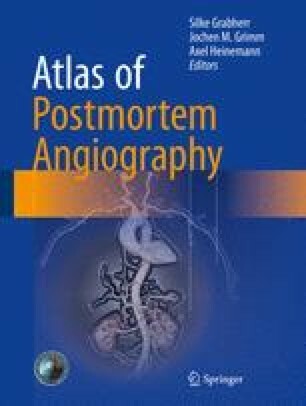 Postmortem angiography (PMA) has a much longer history than most people would suspect. Unfortunately, the greater part of this history is still unknown or has been lost. However, a detailed review of the existing literature indicates that it began in the first days after the discovery of x-rays. This chapter explains the history of the visualization of vessels, starting with casting techniques to explore the interior of the hollow anatomic structure, leading to the first injections into the vascular system and the first radiologic PMA images, finally reaching the zenith of classic PMA at the end of the nineteenth and beginning of the twentieth centuries. During that time, various methods have been applied using different injection materials and techniques as well as different preliminary treatments of organs of interest. The types of injected substances can be divided into six groups: vascular casts, corpuscular preparations in gelatin or agar, corpuscular preparations in aqueous solution, hydrosoluble preparations, oily liquids, and miscellaneous formulations. Furthermore, the visualization methods have varied. In the beginning, simple macroscopic observation was used, and injected vessels could be viewed by the naked eye. Eventually, the methods for visualizing blood vessels became more and more sophisticated. With the introduction of radiologic methods, PMA was finally born. Most often, different techniques were combined, allowing comparison of angiography to macroscopic dissection and histology, among others. Although the techniques varied considerably, most of them had one common feature: they were applicable only on single organs or specific for defined anatomic structures. This limitation may be the reason that the classic methods of PMA are not used today in forensic imaging and that new techniques have been developed instead. However, to understand the problems with postmortem vascular injection and perfusion techniques, it is essential to revisit the historical development of the methodology of vascular perfusion and visualization.